"Pag looker kahit medyo tanga they can get away from it"
.........that according to my friend Alex. True. Society is kind to people who are good looking. Those who say it's not an advantage are on denial. So it pays to invest a little on looks,e specially if your face needs high maintenance like mine. That's why I was very happy when DIANA STALDER invited me for a free treatment a few weeks ago in their main office at Unit 302 Greenfield District Pavilon, Shaw Boulevard Mandaluyong City. I used to be a resident of Bagong Ilog Pasig and often used Edsa Central Mall as a point of entry and exit from the MRT so I was aware of the place. It has been there for years but I have never tried any of their treatments. You can therefore understand my surprise when I found out that Diana Stalder is still in the same location given the instability of the market. As I said, I never tried their services. That's because of the impression that they are expensive. I was wrong.Turns out that they have competitive prices for their services pala. I usually avail of cleaning and that price range they offer is similar to that of the dermatology clinics you see in malls. 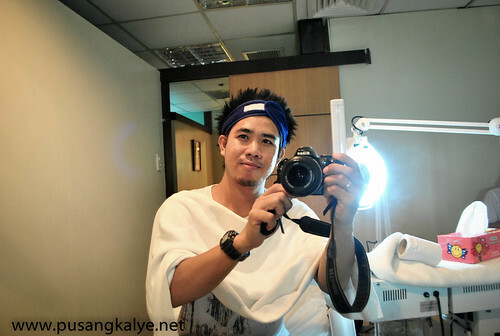 During my visit though, I was treated with a different treatment. I was given four choices , ABSOLUTE RT4 Treatment (wrinkle Prevention), ShineStop (oil Control), Regenin (Botox Alternative) and Re6tense (Skin reaffirming). It I decided to try the first. My session started with cleaning my skin first. 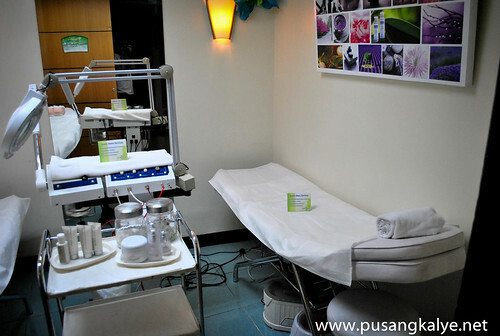 At Diana Stalder, you don't have to wash your face, all you need to do is relax and they will do the cleaning for you. They use cleansers enough to remove dirt and even make-up on your face you don't have to go through the rigors of washing. My therapist then continued with cleaning my face from blackheads,whiteheads and pimples through pricking. It was not as extensive as that of the pimple treatments but it's enough to remove those unwanted fat deposits and impurities on your skin. In other words, enough to feel clean. Then came a series of steps with different applications massaged on the face. Very relaxing and you know it's working. 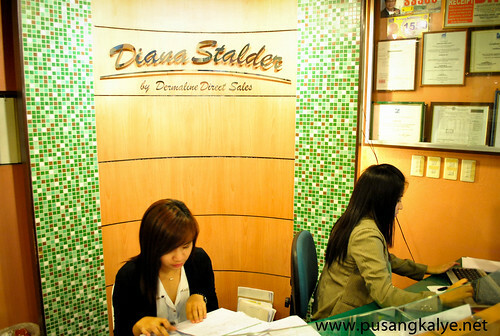 At Diana Stalder branches, each room accommodates only two patients. 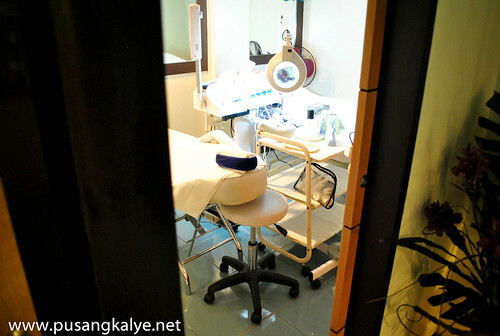 That's in contrast to the usual setup in other clinics where you are seated side by side with the rest of the clients. The rooms are clean and relaxing.Soothing music is also played so its tempting to sleep during treatment. The Absolute RT4 RETINOL Treatment that I involves putting this mask which is the coolest mask I tried---both literally and figuratively.Ang lamig sa mukha!!! I thought they keep it in the fridge or something that's why it's so cold. I was tingling while it was being applied. For a second I felt afraid coz I was asked to close my eyes and not to talk. Yun pala, they had to apply it all over the face except for the opening of the nose. I thought part of the liquid will seep into my eyes and will get hurt but it didn't. Turned our its rubber based. That means, it's also easy to remove. Buo pa nga nung inalis. Galing. 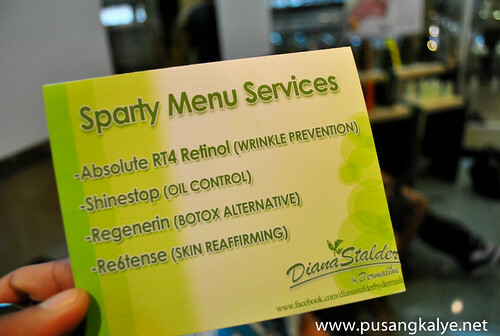 Diana Stalder started as a manufacturer of beauty products before they decided to open clinics in the same field. They wouldn't confirm it to me but I heard rumors that they are the one who supplies skin care products to some of the major clinics in the Philippines. If that's the case, we are assured of only the best products for our skin care. 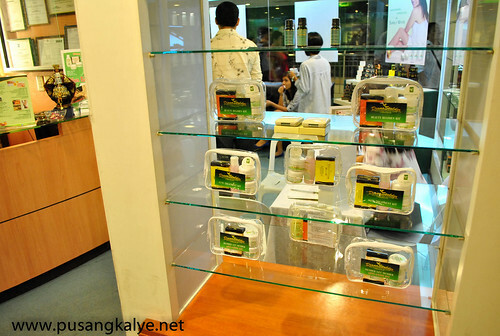 Diana Stalder Face Body Surgicenter by Dermaline, Inc. is the nation's pioneer in Facial and Skin Care Centers. 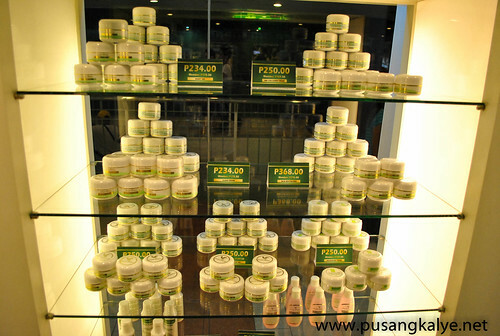 Started in 1996, a member of the Swisse-Phil Holdings Corporation, Diana Stalder currently has 25 branches and counting, all strategically located nationwide: seven corporate and 18 franchise branches. 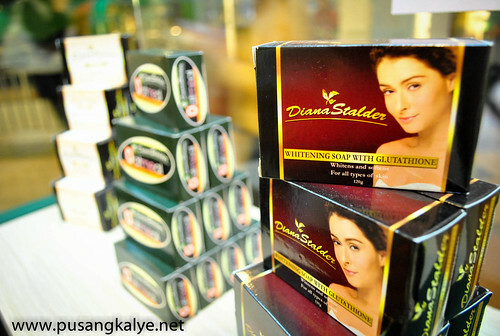 Diana Stalder also exports to countries such as the United States, United Kingdom, Singapore, Bangladesh, and South Korea. Recently awarded as Consumer's Choice 2010 Outstanding Surgical & Skin Care Center and finalist in the 2007 Most Promising Filipino Franchise, Diana Stalder Face Body Surgicenter is member of two well-respected international affiliations, the British Association of Beauty Therapy & Cosmetology (BABTAC) and the International Medical Spa Association. CUBAO Ground Flr. RC-8 Rustans Superstore Bldg. Araneta Center, Cubao Q.C. Absolute RT4 RETINOL Treatment was really good. 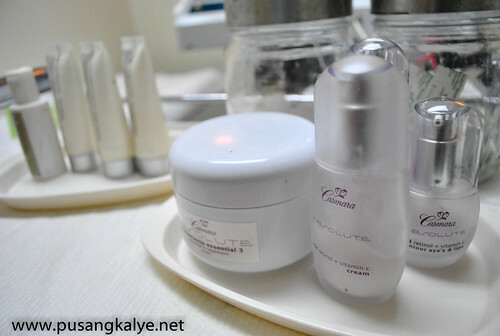 After an hour of treatment, I felt the effect on my skin.I felt it more firm and radiant. It felt like I slept for 10 hours straight. 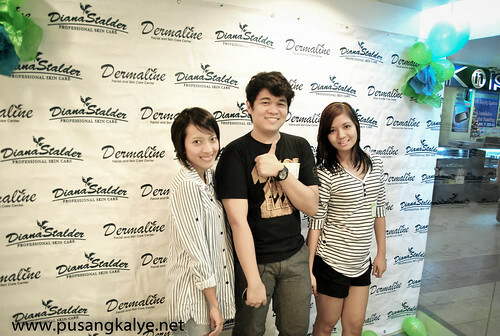 Yeah, other bloggers who were in the clinic thought I just woke up.hahaha. freebie mo ba ang pagpapafacial? Parang gusto ko din itry lalo na yung oil control kasi feel ko nagkakaroon na ako ng butlig sa may forehead area... tsk tsk. Wow. Sorry naman at ikaw na ang may free facial treatment. High maintenance pala tawag sa mukha ko. Haha. gusto ko sanang subukan kaso baka hanap-hanapin ng mukha ko. for sure butas bulsa ko nyan. Yey. I bought their promo 50% sa facial. I gave one to my cousin who's going next week. Ako, punta ako after holy week. It'll be my first facial after 10 years. haha. 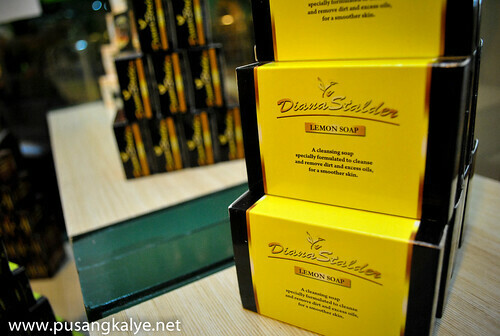 I hope I can blog about it too but i'm lazy to carry my camera e.
You should try DIANA STALDER facial supreme. you'll love it and it's very affordable. The treatment itself is something you'll be grateful plus the setup (few beds in one treatment room) something it's only 2 person in one room. isn't it amazing? with privacy..